I guess that $15 per month data package didn’t quite sell the way Verizon had hoped if we are to believe the screenshot above. We aren’t all that surprised at this little guy going away though, since the 150MB it provided users with was pretty unrealistic from day 1. With the way we all crush data these days, you could eclipse 150MB by watching a single high-quality video on YouTube in about 3 minutes. Oh, and we’re not covering the fact that the plans above reference “3G Smartphones.” They’ve said that since at least October. 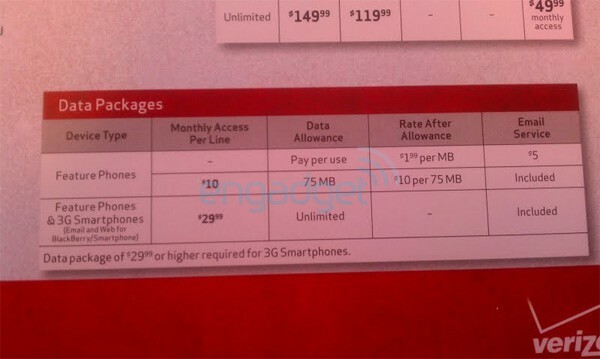 Obviously Big Red is preparing separate data plans for their 4G LTE phones like the HTC Thunderbolt, but this shouldn’t surprise anyone.